This week, our ‘Winery of the Week’ is Hidden Creek Vineyard & Winery. 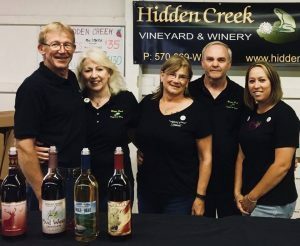 While it may have the word “hidden” in its name, the Hidden Creek Vineyard & Winery is no secret among Bradford and Wyoming County locals who frequent its summer bonfires and events in West Auburn or have come to love its award-winning wines. It all began with the founder and president of the winery, Russ Leichliter, who learned the art of wine making from his grandfather, Edward. Russ and his wife, Ruth, spent their first 30 years of marriage continuing that family tradition as an enjoyable hobby. It wasn’t until years later they realized wine making could be a prosperous business venture. 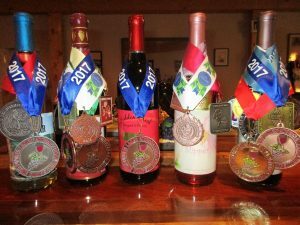 “When the wine industry started making its impact in the northeastern part of Pennsylvania, we believed it was the right time for us to begin the process,” said Ruth. The Hidden Creek Vineyard and Winery officially opened its doors on Nov. 4, 2006 with a ribbon cutting ceremony that welcomed PA Rep. Tina Pickett and other distinguished guests. Now, approaching the business’s 12th anniversary, the Liechliters’ know they made the right choice in seizing the opportunity. Their son Daniel is the only fulltime employee at the winery, whom Ruth says has “a vision to drive Hidden Creek forward.” There is also a serving and sales staff of nine. “They’re the most amazing individuals who set us apart in the area of customer service,” said Ruth. Hidden Creek wines have received numerous Pennsylvania state awards as well as international medals. Hidden Creek’s top-selling sweet wine is the “Bullfrog’s Keg Sangria,” a Vidal Blanc wine blended with guava and passion fruit juice. Then, there’s the popular seasonal “Pumpkin Wine,” inspired by Ruth’s father. The Pumpkin Wine boasts a hint of cinnamon for a pleasant spice. The top semi-sweet wine is the “Bluestone,” blended with citrus notes and northeast Pennsylvania bluestone Catawba grapes to give the varietal a beautiful blue hue. There’s also the semi-dry “Concord 1670,” which earned Russ the prestigious Governor’s Cup along with a number of other award-winning dry reds. Ruth says Hidden Creek guests have also gravitated toward the “Mudwasp” wine, a unique sweet red wine blended with a hint of chocolate. Located in West Auburn, the scenic drive to Hidden Creek takes guests from U.S. Route 6 in Laceyville and out Route 367 to Carter Road. Operating hours for Hidden Creek are Thursday from noon to 5 p.m., Friday and Saturday from noon to 6 p.m. and Sunday from noon to 4 p.m.